Hi everyone! This is Nichole, Sam's admin assistant. Today I want to give you all the details on a new product that has been a game changer for my hair, the Kristin Ess Leave-in Conditioner! My whole life my hair has been described in three ways: thick, wavy, and abundant (as in I have a lot of it). Fast forward through middle school, high school, and college which included perms, at home hair dying and highlighting, a lot of blow drying, straightening, and curling, I am now a 20-something who finally has a good handle on a hair routine that works for me! There's a light at the end of the tunnel! Over the years one of the best pieces of hair advice I've gotten is to embrace my natural waves. Personally the best ways for me to show my waves off is by air drying, or blow drying my hair with a diffuser attachment. 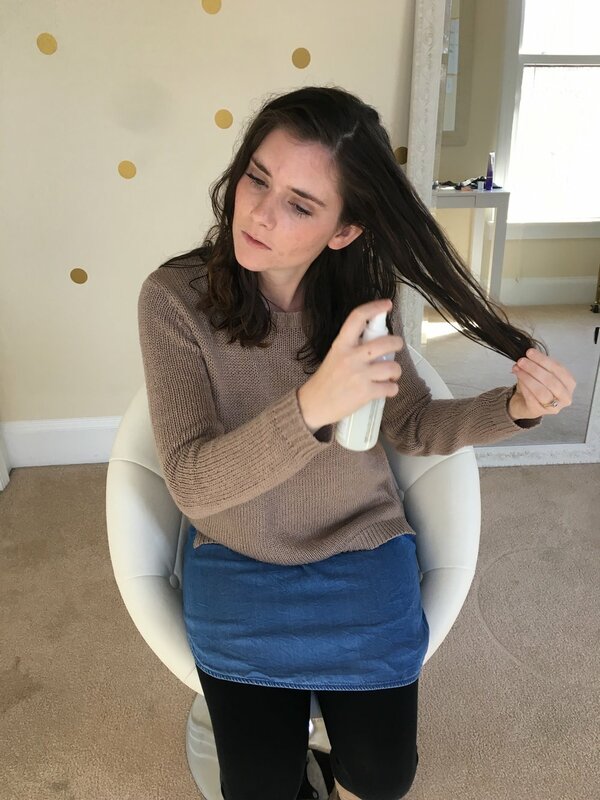 I was inspired to start air drying my hair more thanks to this post and this post on The Beauty Department. Kristin Ess is a hair wizard who works with celebrities like Lauren Conrad, Lucy Hale, and Jenna Dewan Tatum, all of whom are obviously #hairgoals. Her work is amazing, but my favorite part about her mission is that she shares hair tutorials and tips that are perfect for the everyday girl. You can imagine my excitement when she announced she was launching a product line, but what was even better was that she was partnering with Target for it! Basically celebrity level products for those of us on a budget. One product I knew I wanted to try was her Leave-In Conditioner. Kristin states that this is her "number one since day one", so I knew it had to be good. I was so pleased to find that it was only $10 and since it doesn't take much to cover my hair, it will definitely last me a while. I spray it generously on my hair when it's wet (about 10-15 sprays for thick hair, you should do less if you have fine hair), add a light weight curling creme, and do my best not to touch it while it's drying (this is the hardest part, but HANDS OFF, otherwise you will create more frizz). I usually wash my hair after an afternoon run or when I get home from work, that way it has the rest of the night to air dry and I don't have to go to bed with wet hair. The next morning I will usually switch my part up to give my hair volume, and work a mix of frizz creme/styling creme all over to give some texture and tame any frizz. Another great option is to curl my hair with my wand. Since my natural waves are already in full force it doesn't take much to add some loose curls for a more "done" look. So, starting with my hair fairly wet, I part my hair, and spray generously throughout my hair, making sure to get the underneath layers as well. Then, we air dry! Here is my hair about an hour later. Be sure not to touch your hair too much during the air-drying process to avoid further frizzing. Have you tried any of Kristin's products yet? If so let us know!